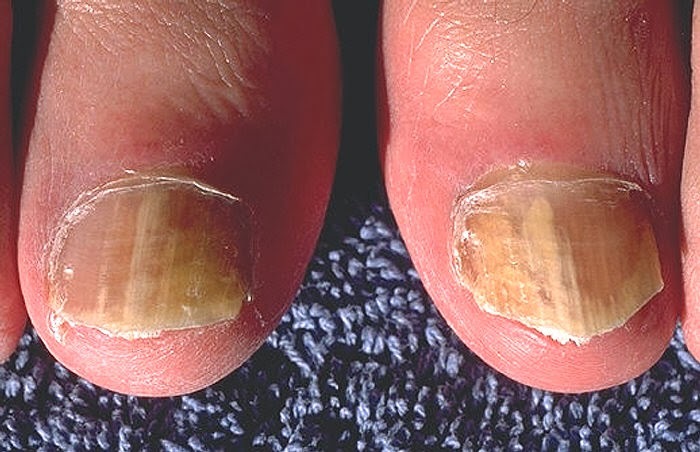 1 What is a fungal nail infection? 2 How do you get a fungal nail infection? 5 Who gets fungal nail infections? Spread from a fungal skin infection. For example, athlete’s foot is a fungal skin infection of the toes. This may spread to the toenails if the skin infection is not treated early. In some cases there is no apparent reason. Fungus germs (fungi) are common and an infection can occur ‘out of the blue. Treatment is not always needed if your infection is mild. Otherwise, your GP may send a clipping of your nail to a laboratory for tests to find out the exact cause of the infection and to rule out other conditions. They will then discuss appropriate treatments with you. Fungal nail infections can be treated and usually cured, but some types of treatment can take several months to work. The main treatment options are either antifungal tablets or antifungal nail paint. Antifungal tablets are the most successful treatment but they may cause side effects. You should discuss this with your GP before deciding which treatment to take. It is important to ensure you look after your nails properly and practise good foot hygiene to stop the infection returning.